Work package lead: Lead Electrical and Automation Engineer Nis Frededal Ebsen. This work package consisted of 14 months of wave flume testing for showcasing and further result validation. After a tendering process a collaborative contract was signed with Alborg University (AAU) who carried out the wave flume tests together with FPP. Show the benefits of the technology to customers, stakeholders, decisions makers. Create third party confidence in technology properties and performance. Obtain further third party verification on key performance parameters. In order to determine the best solution for a long time access to a wave flume, institutions were invited to supply a tender for a 14 month rental of a wave flume, including a skilled test leader. A budget for constructing and operating a wave flume and hiring a skilled test leader on a project contract was created internally. The four different solutions were evaluated on three parameters: Economy, technical suitability of the flume and skills of the test leader. Based on this evaluation it was decided to sign a collaborative agreement contract with Aalborg University (AAU). Apart from the AAU collaborative agreement being the cheapest solution, the high degree of integration with the AAU academic staff was valued very highly. Also the possibility of the publication of scientific papers on the FPP technology by an academic institution with an excellent reputation and track record in the wave industry is expected to be a huge asset for the project. After an initial evaluation of the wave flume size and wave-making capabilities as well as the immediate requirements of validating past data and past and future numerical models it was decided to construct a 1:44 scale model of the absorber chamber and absorber of the P80 device. This model size and setup ensured optimal conditions for validating both previous tests from DHI wave flume and offshore tests from P37 as well as numerical models. The model was constructed mainly by AAU technicians at the wave flume/lab workshop. Originally the wave flume tests were scheduled to end ultimo August 2016 as AAU planned to recommission the lab. However, AAU postponed the closing date given FPP extra opportunity to conduct more tests and extend the tests to the wave basin next to the flume. Initially an absorber and absorber chamber was constructed however, the initial design revealed numerous drawbacks caused by the small gap between the absorber and the sidewalls. It was therefore decided rebuild the absorber and the absorber chamber to enable a series of tests with a larger gap and no side wall at all to reduce the chaotic wave field. The altered design also featured a number of other improvements: a more well-defined geometry, a better ballast system, pressure sensors and a better overtopping protection. The manufacturing of the new absorber was tendered out and the new absorber was manufactured at the end of period 2. Final assembly of the absorber and installation in the flume was carried out in the beginning of period 3 and tests carried out. 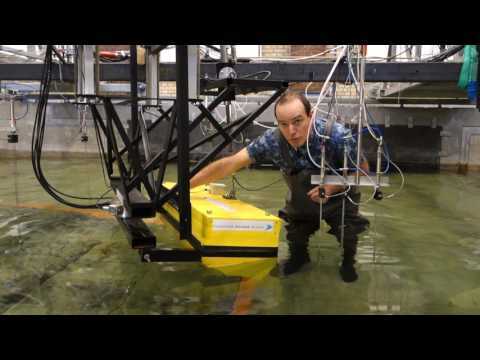 During period 4 only tests in the wave basin at Aalborg University (AAU) were carried out as explained in the video above. As part of the testing a power take-off system (PTO) simulator was constructed to exert a certain force on the absorber. The force to be applied is controlled by a real time numerical models simulating the behaviour of a hydraulic PTO system. With this setup the complexity of the PTO simulation could gradually be increased, from a simple linear damping for numerical model verification to a full simulation of the full scale PTO system all using the same hardware. The PTO simulator was up and running from the beginning of period 2 and again after the rebuild from the beginning of period 3. During construction and initial testing there was physical visits to the wave flume. As it was not always practical for people to travel to the flume in Aalborg, a remote access/tele-presence system was also set up. Using this system live testing in the flume could be seen from all over the world, while in dialogue with the test leader at AAU. This was a highly valuable tool as special tests could be requested during meetings to underpin and showcase the benefits of FPP's technology. The setup in the flume was used extensively to support the business development processes, for example at meetings, conferences and in meetings with potential customers, investors and value chain partners in the UK. Workshops with FPP’s key engineering partners where the test setup in the flume was used as an integrated part of the workshops were also conducted. A group of students visited the flume and participated in the testing as part of a course at AAU. Also the annual meeting in the Danish wave association, Partnerskab for Bølgekraft, was held in Aalborg and the attendees were invited to visit the lab and see the testing of FPP’s absorber model. Furthermore, slides describing the progress of the wave flume tests were produced for presentations. The access to a working lab model was also an invaluable asset for communicating the working principles to new interns with FPP. Two intensive test campaigns were conducted during period 3. The two test campaigns were very efficient because the new more robust model setup allowed the test to run without people present in the lab so that a batch of tests could be configured and automatically be executed in sequence, effectively running tests 24/7. Various tests for numerical model validation were also performed during period 2. During period 4 only tests in the wave basin at Aalborg University (AAU) were carried out. The absorber model with its fixed absorber chamber (bottom plate and side walls) attached to the basin floor, had already been installed at the end of period 3 and only small changes to this setup were carried out during period 4. A range of different values were recorded. i.e. The complexity of the hydrodynamic absorber numerical model was gradually been increased during the tests. At the beginning, the model was mostly based on linear wave theory. The major changes in the model were the inclusion of more and more non-linear effects. This work was done with support from the flume testing. A PhD student funded through the H2020 ICONN project joined FPP in January 2016 for a three year PhD project on numerical models. Also, during period 2 and 3, FPP had an intern working on CFD (Computational Fluid Dynamics) analysis of the absorber and bottom plate/spoiler. The CFD results are expected to bring improvements to the hydrodynamic model by better describing the nonlinear viscous effects. During period 3 data gathered in the wave flume was used to validate the improvements. The implementation of the improved absorber model and setup in the flume strongly benefited the usability of the flume data for model validation. A topic that we have spent a lot of effort on is to accurately include the “side wall effect” experienced in the flume. The tests in the basin enabled tests without the side walls allowing a much better characterization of the “side wall effect” on the tests carried out in the wave flume. This created results that are closer to the effects in the real world and thereby more robust calculations. Following a tendering process, during period 2 Cefront was selected as a strategic partner to perform the needed adaptations of the platform design. DTU Wind performed a due diligence of the wind turbine being able to operate within the operational and survival limitations for an offshore turbine. Following a tendering process, Lloyds Register was selected to develop a long term certification process for FPP’s technology and to perform the first stage of the validation and certification process. During the ICOE conference in Edinburgh, FPP was contacted by the MARIBE consortium. MARIBE is an EU Horizon 2020 project with the purpose of promoting the multi-use of offshore space and developing the blue economy. This is done by working with selected leading technology developers and aiding them in developing business plans and financial models. FPP already had a well-developed business plan and financial models and chose to participate in MARIBE to have a highly competent consortium and advisory panel validate and improve business plans and financial models under an NDA. Through the participation in MARIBE, FPP’s cost and financial models were validated by the consortium partner BVGA and the dialogue with and feedback from BVGA led to fine-tuning of FPP’s internal financial models and a further development and clarification of FPP’s business and deployment plan. All-in-all the MARIBE process provided a lot of highly valuable input and validation that can be used directly in the commercial and capital-raise processes – completely free of external cost to FPP. During period 3 it was decided to commission BVGA to carry out a thorough check of the models' math and especially the individual detailed cost figures, which have never been checked and validated by a third party. Currently FPP is in a due diligence process with end-customer and commercial project partner DP Energy. This project leverages heavily on the external reports submitted during period 4. D4.1 Report on test and data - confidential report and therefore not accessible here. D4.2 Visits and visitor feed back log- confidential report and therefore not accessible here. D4.3 External verification reports, including models- confidential and therefore not accessible here.